1. Customization. The Aegean urn vault is available in white marble, black marble and rose granite finishes. You can customize the Aegean even further by choosing an Appliqué® from our library, or work with our designers to create a custom tribute. View our complete Appliqué library. 2. The Healing Tree®. The Aegean Healing Tree urn vault encourages families to participate in an interactive celebration of life at the graveside. Learn how the Healing Tree adds value to graveside services. 3. It comes in an easy-to-lift version. 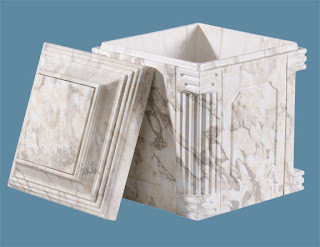 The Aegean Ultra urn vault uses a special low-density concrete formula. The result is a beautiful urn vault that is significantly lighter than a traditional urn vault without sacrificing strength. Discover the benefits of our lighter cremation solution. What's your favorite thing about the Aegean urn vault? Share it with us on the Trigard Facebook page.